I looked forward to the High Tatras mountains a lot because when I was born these mountains still belonged to my country Czechoslovakia. Now the Tatras are shared just between Slovakia and Poland after the Czechoslovakian state split in 1993. The High Tatras are sharp and beautiful mountains and I had a real respect to them as well as many expectations. In the end, the summits turned out to be more tricky than I expected. Due to bad weather conditions I had to wait for three days in the village Starý Smokovec and despite waiting the Rysy mountain still surprised me with snow. Bad weather in Slovakia made me to change the plans for the first time during my expedition. I wanted to climb the highest mountain of Slovakia Gerlachovský Štít first but the weather was so bad for three days that it was impossible. Luckily it was not difficult to find an alternative plan. We just followed the simple rule: It doesn’t rain in pubs, cafes and restaurants so we tasted some local specialties and loaded some energy. What a preparation for next climb! 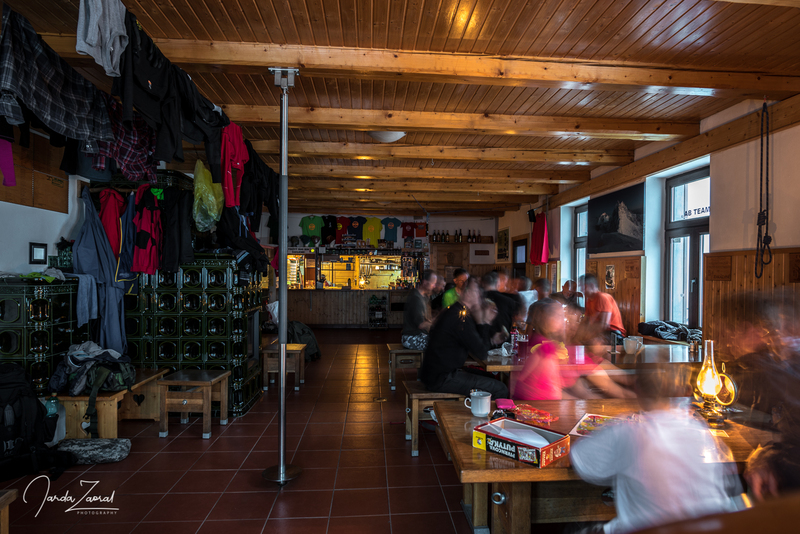 The only problem was that my father also found an amazing café with the best beer which I had on my whole expedition. I am not sure if the amount of beer we had was a good preparation too. The weather forecast was not much better for the following day either but my time was running out so I couldn’t afford to wait any longer. 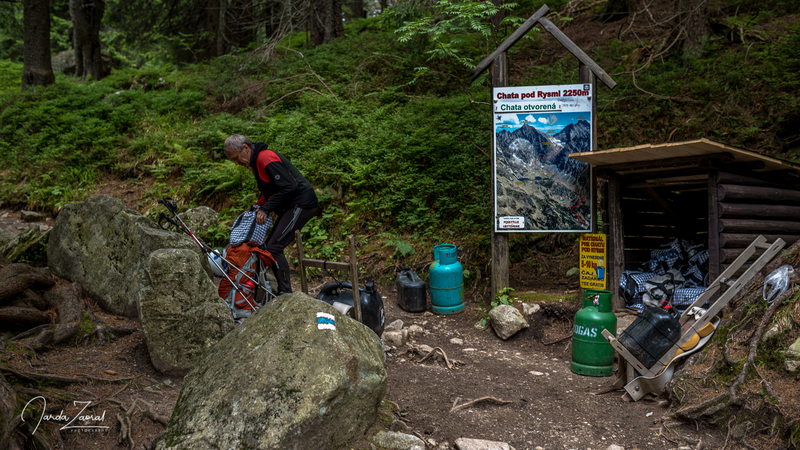 In the end my father and I decided to visit mountain Rysy first despite an expected shower and try to attempt to summit Gerlachovský Štít later during better weather. The Polish highest point Rysy is much easier to summit. There is a very nice path leading to the top and there is also a cabin called Chata pod Rysmi just 200m below it. This cabin became our goal the first day. Then depending on weather we wanted to summit Rysy either in the evening or during the following morning. Unfortunately, we had to choose the easier way up from Slovakian side. The way up from the Polish side is much more exposed and we didn’t want to risk any danger. The weather forecast was not good so we started our trip from Popradské Pleso. 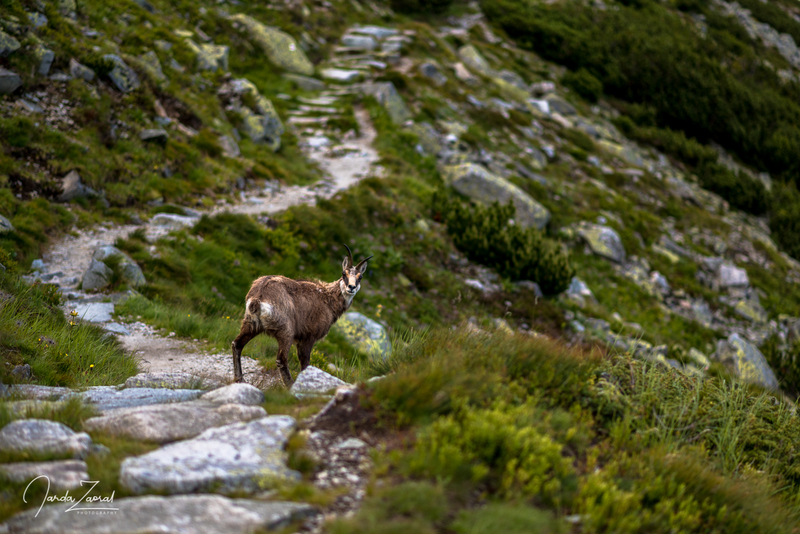 The big advantage of the High Tatras is that you can reach the entrances to the national park by train. This place was not an exception. We took a lunch at Popradské Pleso and my father felt so strong after eating local goulash that he accepted a challenge to bring some supply to the mountain cabin Chata Pod Rysmi. This cabin works on an amazing principle. Since there is no road leading to it the only way to carry there food and other products for local restaurant is on people’s backs. If you manage to carry 5kg+ to the hut you will receive a reward – a hot tea. The cabin has been working on this voluntary principle since its opening and it has worked perfectly so far. I am proud of my father who managed to take up 5kg of beer. I was happy with my 20kg of climbing and camera equipment so I sadly didn’t help this time. The weather forecast worked! We were halfway to the cabin when a storm came. To our surprise it was not raining though but snowing. 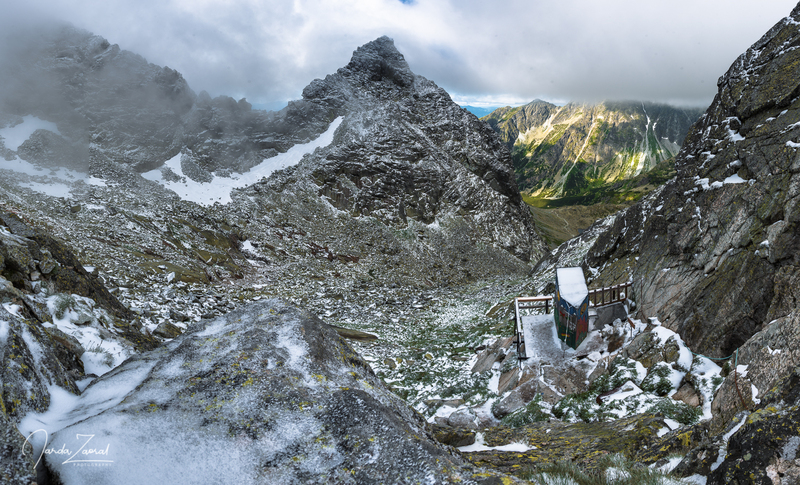 After half an hour the High Tatras received 5cm of fresh snow. Very surprising for the 1st of July. Luckily the path uphill was so steep that we never got cold. Just before reaching the mountain hut the storm finished and dark clouds disappeared. Suddenly, we got an amazing view over surrounding mountains. I especially liked the view from the local latrine. Amazing place if you need to poo. Since we managed to ascent 1000m and ended up in a small blizzard we got hungry. We ordered typical Slovak food “Halušky s bryndzou” and to our surprise the food was better and cheaper than back in the valley! This cabin is amazing! Unfortunately, clouds came back while we were eating so we didn’t go up to the mountain Rysy that day. Instead, we joined a little party with Slovak, Czech and Dutch visitors. There was a perfect atmosphere. Nobody was checking Facebook since there was no signal. We played cards under candlelight since there was no electricity and drank chilled beers taken up by my father. As a bonus children of the cabin manager played relaxing piano songs. Next day I woke up at 3:30 a.m. to go up for sunrise. When I came to the window though I found out that the fog is even thicker than last night so I decided to continue sleeping. We woke up later at 6 a.m. but the weather was still the same. We took an excellent breakfast and wanted to go up. The weather was worse and worse though so we ordered some mulled wine. This order made my slightly impatient father able to wait a bit longer and finally at around 10 a.m. weather started to improve. Time to go! It took only one hour to summit the peak. The problem was which is the right one? The mountain Rysy has three peaks- the highest, the middle and the lowest. Instinctively I climbed the highest (2503m) one but when looking on my map I realized that it was not the highest point of Poland. The peak I was standing on was lying in Slovakia. That’s why I had to descent to the middle one which lies on the border with Poland and that was finally the correct peak. Our timing couldn’t be better. The clouds disappeared just when we arrived and we had a wonderful view over winter on the peaks and summer in the valleys. Then, we had to go back in the valley. The 10km long descent to Popradské Sedlo was tiring but still ok. The problem was that once we received phone coverage again we found out that the weather forecast for the following day is perfect. That meant the only thing: We have to move to the starting point of the climb to Gerlachovský Štít which is an additional 15 km hike. Good that it went smoother at least thanks to this awesome guide. We made it to the hut Sliezský Dom late in the evening. If you decide to climb the mountain Rysy, stay at the cabin Chata Pod Rysmi. It was for sure one of the most cozy accommodations on my whole expedition. Summit both the highest and the middle peak of Rysy. 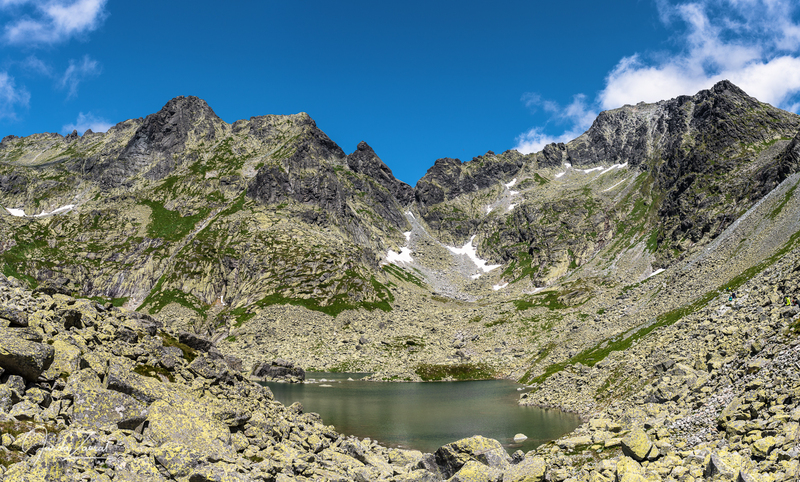 Surprisingly, the middle peak is the highest point of Poland. Help the mountain cabin Pod Rysmi and bring up at least a bit of supply. If you feel strong enough, you can bring over 5Kg and you will get a free tea.